Handtrucks2go is proud to bring you the full line of OZ lifting products, which include all kinds of manual and electrical hoists as well as gantry and JIB cranes. OZ is committed to providing safe, high quality material handling equipment with a dedication to excellent customer service and support. One of the reasons we especially like dealing with OZ is the quick turn around and shipping time and the fact that we can semi customize the options without major upcharges. Quality control is agiven at OZ, before shipping any hoist, OZ will rig the chain to the standard or requested length, set the overload using their standard for overload protection devices, and, again, triple test the hoist to 50% over the rated load. Each hoist is double checked from gear side to brake side, and initialed by two OZ Techs. A test certificate is then generated with all of the load test information. Let us know if we can assist you finding the right OZ lift for your needs. OZ hoists are currently being used in Boeing, Proctor and Gamble, Exxon, International Paper, Caterpillar, Military Bases, the Port Authority, Georgia Pacific, International Oil, Savannah nuclear power plant , DuPont, and United Airlines to name a few. 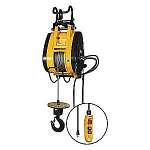 OZ Hoists and trolleyâ€™s are used in the following industries, mines, shipyards, oil rigs , power plants ,wind turbine, construction, manufacturing, and many general applications.